Sites for testing wave and tidal energy off the west coast of Anglesey and south Pembrokeshire have been approved. 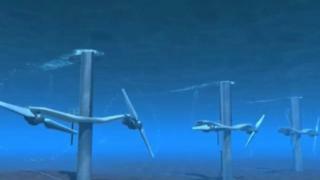 The Crown Estate said that leasing the sites for technology development was "critical" for the UK to unlock the potential of wave and tidal energy. First Minister Carwyn Jones said the benefits could be significant in terms of the economy and renewable energy. Wales's first commercial tidal energy farm is due to launch off Anglesey in summer 2016. Its electricity generators will operate like wind turbines but with blades driven by tidal wave action. Menter Mon and Wave Hub were confirmed by the Crown Estate as managers for the west Anglesey tidal and south Pembrokeshire wave demonstration zones respectively. They will prepare and manage the sites for sub-letting to developers. In addition, development rights for a tidal site off Holyhead Deep have been granted to Minesto. Rob Hastings, director of energy and infrastructure at the Crown Estate said: "By providing these additional seabed rights we are pleased to be enabling further technology development and commercialisation, which will be critical if the UK is to unlock its significant natural resources for wave and tidal current energy. "This innovative approach to leasing the seabed sees us responding to market demand and introducing managed demonstration zones to give other organisations the opportunity to lend tangible support in their local areas." First Minster Carwyn Jones said: "The energetic waters off our coast are ideal for marine renewable energy projects. "Our ports, supply-chain infrastructure and grid infrastructure also put us in an enviable position for developing a thriving marine energy market, both as a significant generator and as an exporter of marine energy knowledge, technologies and services." Gareth Clubb, director of Friends of the Earth Cymru said: "To having testing sites approved for marine renewable energy is a significant step forward."